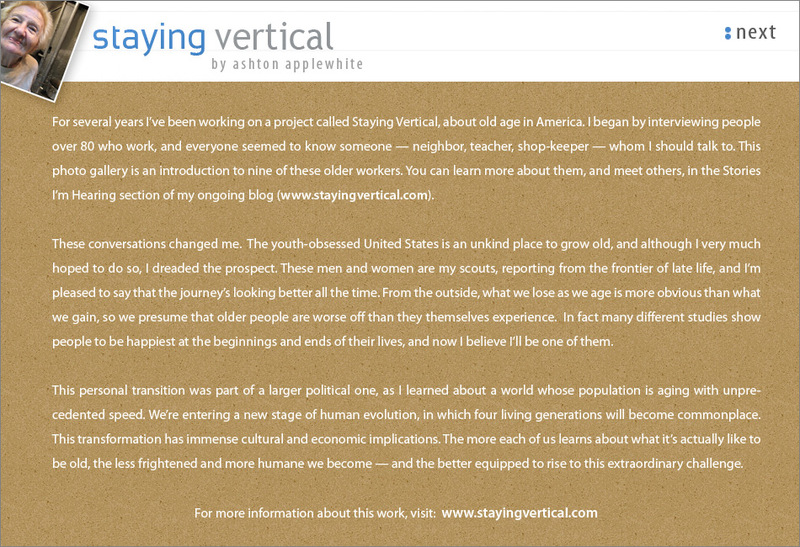 For several years I’ve been working on a project called Staying Vertical, about old age in America. I began by interviewing people over 80 who work, and everyone seemed to know someone — neighbor, teacher, shop-keeper — whom I should talk to. 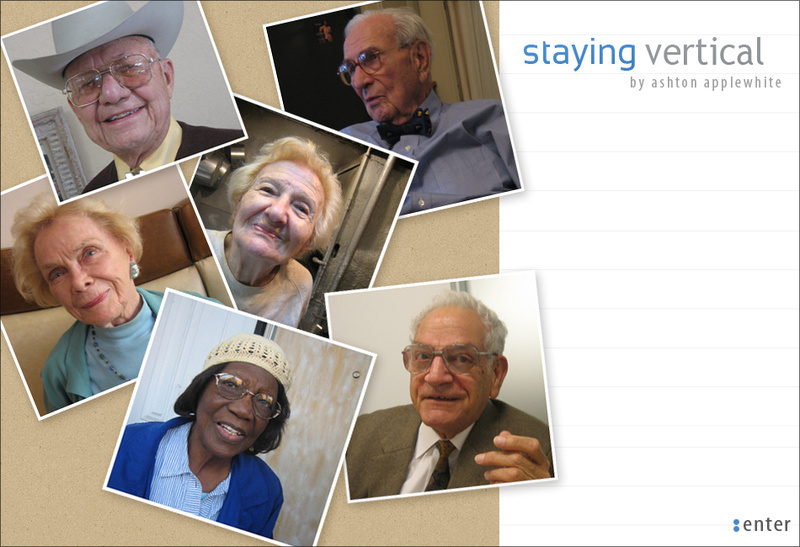 This photo gallery is an introduction to nine of these older workers. |2012-10-19 14:07:39 paulina - necesito un favor, gracias. Soy estudiante y necesito ver si pueden entregarme material fotografico (grande) de adultos mayores, pero felices. ¿Cómo que entregarte "material fotográfico grande"? ¿Así nada más por que tú lo necesitas? No. Nosotros somos una publicación que dedica muchos recursos tanto humanos como económicos a difundir la obra de artistas en la que creemos puede servir para difundir ideas. Cada artista es dueño de su trabajo y si te interesa alguno en particular puedes escribirles personalmente solicitando permiso para reproducir su obra y explicando en qué contexto lo harás y con qué fin. Te recomiendo que revises el tono con el que escribes si quieres tener éxito. |2011-04-14 15:11:48 Catherine Holland - Kudos! Wow, beautiful work! The combination of the words, images, and voices drove home so powerfully how many assumptions I make about aging, my own included. I found myself saying that these individuals couldn't possibly be born in the years listed, that they express such vitality and engagement, while recognizing the very problem with my disbelief. The deal is that Indiana Payday Loans online can save your time, nerves and make a solution of all your financial problems. Since its introduction in the market buying Buy Generic Cialis can be exclusively in pharmacy chains with a prescription from a doctor. I agree that this is very inconvenient and takes a lot of time and effort.